Bron, France, March 2th, 2017. 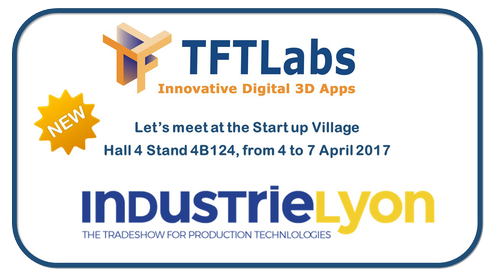 TFTLabs develops a secure and innovative platform for viewing 2D/3D models on all formats from an Internet browser or mobile/tablet. the European leading fair where all innovative technologies converge, to be held from 4 to 7 April 2017 at Eurexpo Lyon, France. --> Let’s meet at theStart up Village, Hall 4 Stand 4B124 !! visitor numbers. It is also an event that listens to the feedback from manufacturers and manages to retain its manageable and friendly format. Click onthis link to access the show website. With TFTLabs technology, It becomes easy to add 2D/3D models to a website or client application to speed up its digital transition. We are specialized in data encryption and decryption. We develop also 3D converters to connect fields of mechanics, infrastructure (BIM) and augmented reality. This technology has been entirely designed and developed by TFTLabs, which gives us total independence and flexibility in the customization of our applications.